Making and freezing containers of this Soup Base will give you all the homemade slow cooked goodness of from scratch soup, with the speed of a quick, convenience meal all wrapped into one. 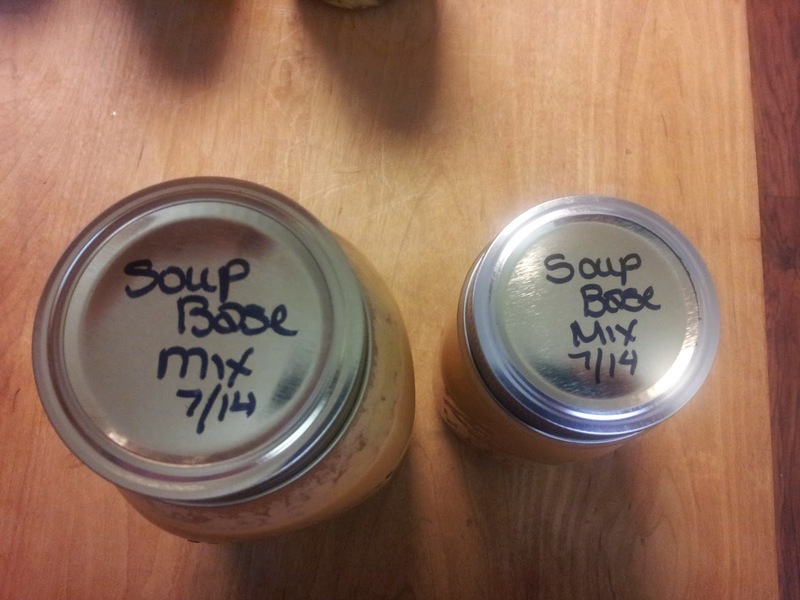 During summer when my tomatoes are coming out of ears, I make sure to make a batch of this soup base and store it in the freezer. Its perfect to thaw and either use in the crockpot or on the stove top for a meal in minutes. Its' the perfect base for making: Creamy Tomato Soup, Minestrone, Chili, Kielbasa & Bean soup and much more! If you don't grow your own tomatoes but have friends and coworkers that share theirs, this is worth saving those tomatoes for and make this with them! Place tomatoes on baking sheet. Sprinkle minced garlic over tomatoes. Drizzle 1/4 cup oil over tomatoes and toss tomatoes to mix well. Bake 15-20 minutes till tomatoes are soft and roasted. Remove skins from tomatoes, and lightly crush tomatoes with your hands. In large sauce pan add 2 Tablespoons oil and onions. Saute over medium heat till soft. water, salt, broth and any optional vegetables. Turn down heat and slow simmer 30-45 minutes till vegetables are tender. Remove from heat. Let cool 5 minutes. Store in freezer safe containers. Store in freezer, use within 3 months. Beans: Cannellini, Kidney, Black, etc. Leftover diced ham, chicken or beef. Click here for my Roasted Creamy Tomato Soup recipe! What would you add in ?